This is one of their adverts. Anyone driving towards London’s airports through Northamptonshire, Buckinghamshire or Oxfordshire is in for a shock. According to Birmingham Airport’s chief executive Paul Kehoe, “it’s been predicted that passenger numbers in Britain will increase by another 125 million by 2030”. He adds that, “with Heathrow full and Gatwick nearing capacity, it’s clear the South East will soon have a capacity problem unless something is done”. His message is strategically timed. This summer, the government is expected to publish its long-awaited strategy for UK aviation, and he hopes his airport can be part of the solution. A coherent, joined-up policy on airports has eluded one government after another, year after year. I remember about a decade ago on my way into a meeting of local business people, I unexpectedly found I had the ear of a then transport minister. I asked why the government was planning a new aviation strategy. Anyone can see why it has proved so hot for successive governments to handle. Balancing the demands of the aviation industry with the obvious environmental concerns is not the stuff of popular politics. Result: inconsistency, short-termism and series of one contradictory policy to another. Take, for example, the endless to-ing and fro-ing over a third runway at Heathrow. The Labour government backed the proposal, which they said would help keep London ahead of the likes of Frankfurt, Amsterdam and Paris Charles de Gaulle. Then in came the coalition, determined to prove itself “the greenest government ever” and the third runway was scrapped. Ministers promised instead that high speed rail would reduce the number of domestic flights sufficiently for Britain’s main gateway airport to meet growing demand for international flights with its existing runways. That would certainly chime with the constituents of the Transport Secretary Justine Greening in Putney, underneath one of Heathrow’s main flight paths. (Though of course cabinet ministers always tell us they put their own parochial concerns to one side when deciding government policy). But with mounting speculation that the bill paving the way for high-speed rail may not pass through Parliament before the next election, the airlines and Heathrow’s owners, BAA, are renewing their pressure on ministers for yet another about-turn on the third runway. There has also been talk that the government may be warming to an idea floated by London’s mayor for a new airport in the Thames Estuary, nicknamed ‘Boris Island‘. But neither of these proposals is for the here and now. 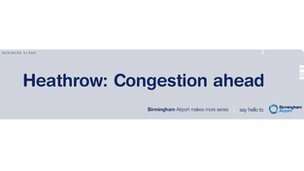 Birmingham’s airport managers say after a £200 million investment programme, they could handle an extra nine million passengers a year from now. They have 143 non-stop destinations in Europe, North America and the Indian subcontinent. The new runway extension will also enable direct services to the Far East, South Africa and the US west coast from next year. Meantime Chris Crean of Friends of the Earth in the West Midlands has a different answer altogether. He says we need to wean ourselves off our over dependence on unsustainable air travel which he says is doing great damage to the ozone layer, polluting the atmosphere and swallowing up vast swathes of hitherto green open spaces. He also accuses the politicians of giving the aviation industry what he sees as an unwarranted subsidy by exempting aviation fuel and the aircraft themselves from VAT. And he says the longer the Government delays a decision over what to do about the London airports, the more Birmingham Airport will exploit the uncertainty by suggesting it has the answer to the capacity problems in the South East. Have your say on what you think makes sense for aviation. Make a comment on this blog post and I’ll hope to read it out during this weekend’s Sunday Politics programme from 12:00 noon on BBC One on Sunday, 10 June 2012. Birmingham Airport is run as a public/private partnership. Birmingham Airport is the UK’s third largest airport outside London. The airport currently serves 143 direct scheduled and charter routes. It also offers an additional 279 possible connections worldwide. Birmingham Airport handles nine million passengers per annum.